Made using 30 kinds of spices, 18 kinds of vegetables, and 4 kinds of fruits. The richness of Fond de Veau and the umami of vegetables and fruits, condensed into mild curry flakes. The flakes dissolve with ease, and were made using 30 kinds of spices (among other ingredients) distributed in a roux made with care from wheat flour and fats. Seasonings such as sauces and spices can be a crucial part of a meal, turning plain food into a delicious experience. After all, sometimes we only think we don’t like certain foods because we haven’t tried them with the right seasoning! 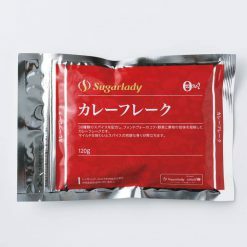 Sugarlady’s curry flakes and other seasoning products are safe and free of chemical seasonings and additives, letting the true, natural flavors of the ingredients themselves shine – and allowing you to enjoy your meal without worry. 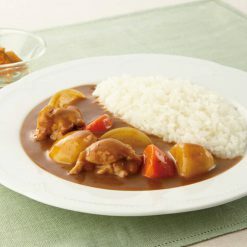 How to make curry (6 servings): Ingredients: Curry flakes: 1 bag (120g) Meat (beef/pork/chicken/etc): 250g Onions: 250g (1.5 mid-sized onions) Potatoes: 200g (1 large potato) Carrots: 100g (1 small carrot) Salad oil: a suitable amountWater: 650-700mlInstructions: ① Heat the salad oil in a thick pot, then sauté the meat and vegetables (cut into suitably-sized pieces); not allowing any of the pieces to burn. ② Add 650ml of water. Once it boils, skim off the foam, then cook the ingredients on medium heat until they become soft. ③ Turn off the heat, add the curry flakes, and stir well. Then, turn the heat back on, cook on low until the mixture acquires viscosity, and you’re done! Depending on your cooking implements, the amount of evaporation may vary. Add water if your mixture becomes too thick or viscous, and feel free to use curry powder as well as curry flakes in your dish if our curry flakes are not spicy enough for your tastes! This product contains edible fats and oils (beef tallow, pig fat), wheat flour, table salt, sugar, curry powder, concentrated mixed vegetable/fruit/nut juice, beef extract, yeast extract, sautéed onions, seasoning vegetables (onion powder, garlic powder, ginger powder), cornstarch, spices, cocoa powder, Fond de Veau, chutney, banana purée, apple paste.. This product is not suitable for anyone with allergies to wheat, beef, soy, chicken, pork, apple, gelatin or banana.